Since I left home for WTI back on September 5th, I really haven’t done much. I don’t just mean woodworking wise, I’m talking about day to day life. I have however manage to watch an impressive amount of TV shows. I’ve been able to start and finish or catch up to The Walking Dead, Game of Thrones, Blue Mountain State, and White Collar to name a few. I’ve also been able to watch a ridiculous amount of movies. BUT, that’s not all I’ve done (just mostly). Since I can’t do woodworking, I’ve been Sketch(ing)Up some ideas. Now I think lots if not most hobby woodworker have some type of “business”. Now I don’t mean an official business that we need involve Uncle Sam in, but something’s gotta pay for all the wood and tools. Mine happens to be frames and shadow boxes. I mean what kind of Marine woodworker would I be if I didn’t make shadow boxes! It helps keep me in supply of wood and can sometime generate enough for new tools now and then. Well since my wife left the Marine Corps after 8 years to take on the job of homemaker, I’ve been wanting to make her something special for her to remember her time (even if she doesn’t want to) in the Marine Corps. She did receive a shadow box from her shop upon EASing but it’s a cheap store bought one. I did offer to make hers but her Gunny did want me to make it since it was a shop gift and I wasn’t in their shop. Anyways, she’s always told me she wanted a chest to put her uniforms in so I wanted to design something that would house a (new) shadow box and her uniforms as well as any other misc items she may want in there. I know this is no new design but I haven’t been able to find anything that closely resembles the potential quality that mine has. The shadow box is built into the lid so it’s not a matter of removing it entirely and accessing it from the back like my typical shadow boxes. Idea after idea my bubbles kept popping. It wasn’t until I re-stumbled across an article in issue#213 of Fine Woodworking that it hit me! Mitered frame dovetails!! 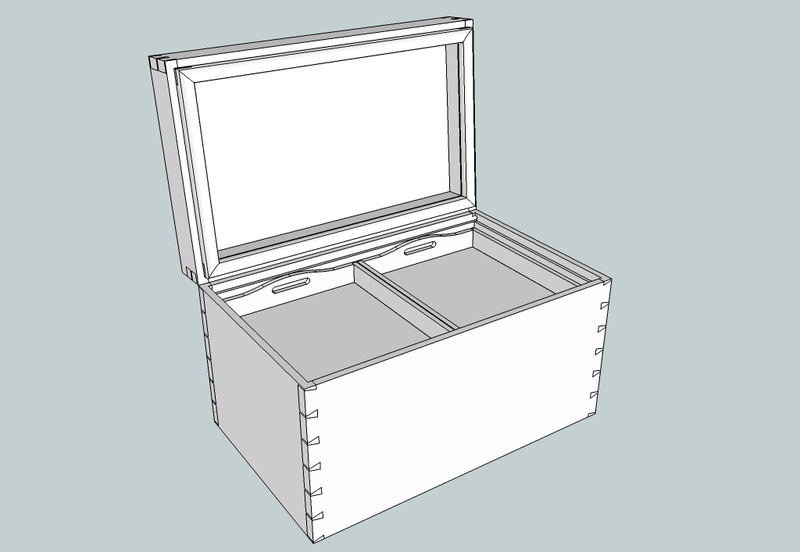 Here’s what I’m thinking; set the sides of the case in the lid and then basically make a false front. Three of the sides would be permanently mounted with a fourth that would be removable to access the mounting board. You can get what you need done and when you’re finish, place the piece back on and it would still look complete. While it sounds simple enough, it probably won’t be. That’s why it’s a concept. 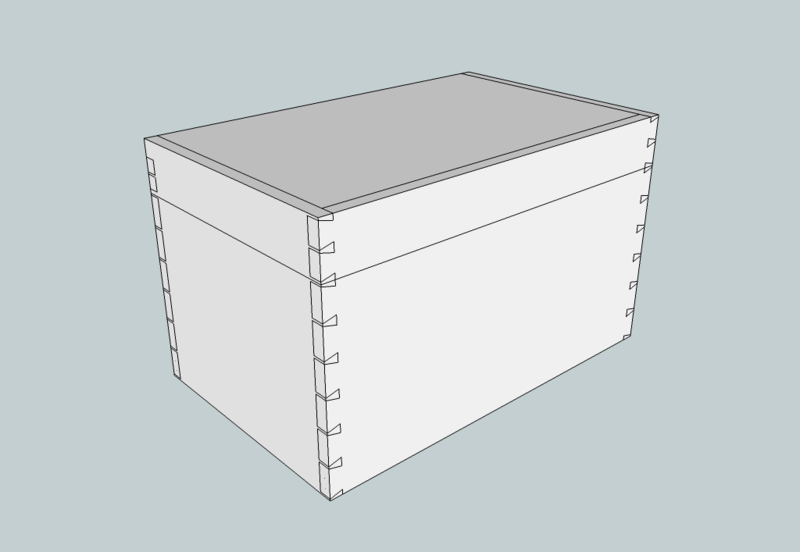 A couple other notes that I want to mention… The lid design is taken straight from Tony Konovaloff’s tool chest. Although it seems to be completely out of my league, that won’t stop me from trying. Next, I wanted it to resemble a foot locker in shape. For that reason there is no kick plate to hide a through groove for the base so there will be a stopped groove….. I think that’s it for now. I look forward to starting this once my bench is complete!